Leading Manufacturer of cold rooms, freezer rooms, vegetables chiller rooms, cold storage rooms and water chillers from New Delhi. 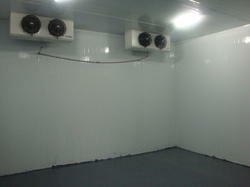 We hold expertise in providing our customers with a wide range of Cold Rooms as per the requirements of the customers. Owing to high quality standards, these are widely used in Hotel, Food Chain, Hospitals and Research Centers. Defending on the requirement of temperatures and the budget, we offer an extensive range. Further, our cold rooms also find applications in Restaurant Chains, Food Service, Hospitals and Pharmaceutical Industries. Pre-fabricated panels for easy assembly, cam lock with tongue and groove sections assembly. High capacity suction fans which can carry more specific heat and maintain humidity in the "AHATA INDUSTRIES" Cold Rooms automatically. Fully automatic electric/air/Gas defrost system. Freezer Rooms ideal for large capacity storage with multiple freezer compartments designed to replace multiple upright freezers with a single unit. 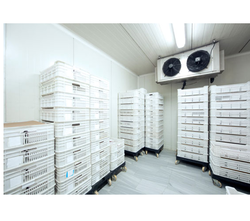 We are reputed enterprises in this industry, offering a wide assortment of Vegetables Chiller Rooms that are used for cold storage of vegetables. The offered chiller rooms are manufactured using the best quality components and advanced technology. Our provided chiller rooms are made available to the customers in various models at nominal prices. Apart from this, these chiller rooms are tested against various quality parameters to ensure their quality. 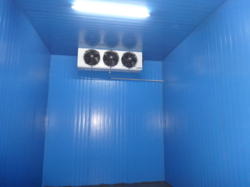 Our rapidly growing organization is providing a wide range of Cold Storage Room. The offered storage room is ideal place for storing perishable products. Our provided storage room is manufactured using the finest quality components and the latest technology by our skilled professionals. Furthermore, this storage room is well constructed in hospitals, dairy, agriculture sector, pharmaceutical industry etc. Clients can avail this storage room from us at affordable prices. We offer our clients an extensive range of Water Chillers that is fully automatic with tested controls. These are fabricated using optimum quality of basic material which is sourced from authentic vendors. Our professionals with their diligence design the entire array of chillers as per the modern trends of the market. Our water chillers are widely appreciated by the customers as these ensure fast chilling with shell and tube type evaporators. Looking for Refrigeration Rooms ?